The very best fantasy films hypnotize with an aura of uneasy wonder, as though we are observing something foreign yet fundamentally familiar. The Dark Crystal from Jim Henson and Frank Oz is just such a film. Heralded as “the first live-action film with no human characters”, Henson and Oz weave a fabulous aphorism of the duality of human nature set on a scarred, alien world. The result is a piece of magic – a dark fantasy film for children that respects their intellects and emotions and thereby resounds as an absolute classic. The Dark Crystal opens by blaring the first few measures of its theme over the Universal logo – the planet Earth, and then quickly abandoning it. Then, a narrator (Joseph O’Connor) confirms that we are far from home. He tells of a better time when this world was whole and green, and laments at the sundering of The Crystal. “Then”, he says, “Strife began, and two new races appeared: the cruel Skeksis, the gentle Mystics.” Here, it is intimated that the two races are related, and the concept of the duality of a single consciousness is introduced. Of note, the Skeksis and Mystics Themes combine musically to form the greater “Dark Crystal” Theme, foreshadowing the narrative of the film through its music. This duality is critical to the structure of the film, and parallels emerge throughout the early portions of the first act to establish it. The narrator himself provides many of these parallels in the first five minutes. When introducing the Skeksis, he remarks that, “For a thousand years they have ruled – yet now there are only ten. A dying race ruled by a dying emperor.” Describing the Mystics minutes later using a parallel structure and diction, the dichotomy is clear: “A thousand years ago, the crystal cracked . . . the race of Mystics came to live in a dream of peace, their ways were the gentle ways of natural wizards, yet now there are only ten, a dying race.” From the very beginning we are drawn to recognize the relationship between these creatures, but it goes beyond mere words. 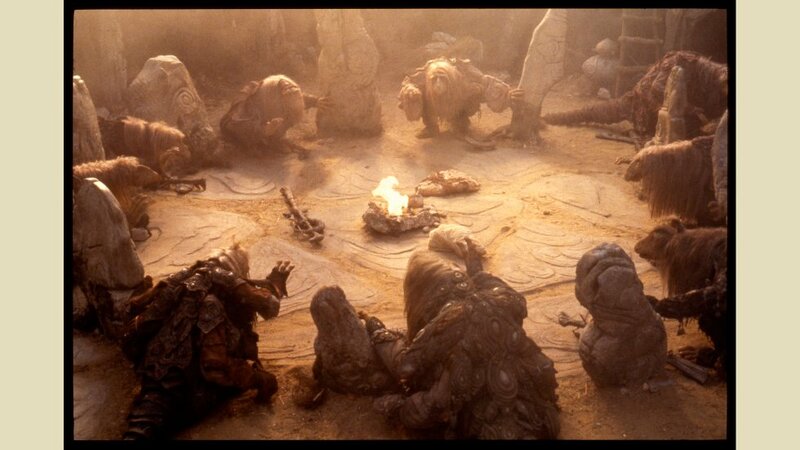 The Skeksis performing The Ceremony of the Sun, extending their lifespan through the power of The Dark Crystal. Further, we get more parallel diction from the narrator: “But today the ritual gives no comfort, today the wisest of the Mystics lies dying, today they summon the one who must save them.” As before we have repetition of “today” through three clauses, all of which perfectly parallel the corresponding description of the Skeksis. Through a few simple lines of narration and careful composition of a few scenes, we are taught all we need to know about the relationship between the Skeksis and the Mystics, and only later do we get the confirmation and payoff of that relationship. With that relationship established, the narrative of the film can then begin. Jen, a gelfling, is tasked with locating the aforementioned crystal shard and ultimately mending the Dark Crystal. Along the way he meets other fantastic characters like Aughra, another gelfling named Kira and her boyfriend-hating tooth-dog Fizzgig, and others. At the same time, the Skeksis are aware of a prophecy which states that a gelfling will effect the end of their race, so they are intent on capturing and killing Jen and Kira – just as past Skesis have done to nearly the entire gelfling race. That’s right – this is a film for children quite happy to feature genocide as a major plot element. Jen and Kira’s adventures take them through the wilderness to the Skeksis’ castle where they are forced to confront the giant, beetle-like Garthim to save the Pod people who raised Kira. Along the way we get more explicit demonstrations of the connection between the Mystics and Skeksis, as Jen uses the crystal shard to slice the hand of the Skeksis Chamerlain. In the next shot, we see a corresponding Mystic lament that his hand is also bleeding. These races are made up of fragmented individuals – the cruel Skeksis representing the materialistic side, and the gentle Mystics representing the natural, caring side. Eventually, the gelflings are able to heal the crystal, and we see the Skeksis and Mystics unite into the UrSkeks – tall glowing humanoids which represent a unified individual, complete with aspects of evil and good. The UrSeks leader then remarks that this new world is for Jen and Kira, and we see that the barren landscape of the dark age has been replaces by a verdant new world teeming with life. The Dark Crystal dramatizes the fractured nature of the human psyche through an otherworldly tale about two parallel alien races healing an ancient schism. The film revels in its serious subject matter with an overall dark tone, but it is also incredibly vivid and detailed. Watching The Dark Crystal is akin to traveling to another dimension, and then discovering that you were already there and you just didn’t know it. It at once mystifies and inspires, and its unique aesthetic derived from puppetry performances and animatronics is not likely to be repeated in the history of cinema.